← London 2012, Women’s Pool B: Argentina 2-1 New Zealand. 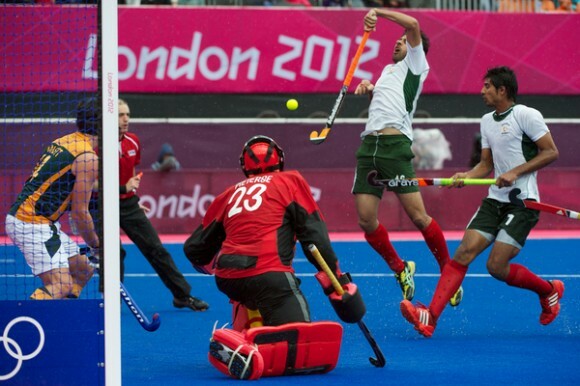 London 2012, Men’s Pool A: Pakistan 5-4 South Africa. 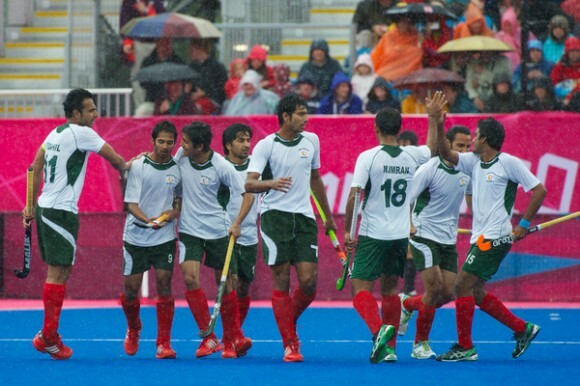 The great British weather was in full effect here at the Riverbank Arena this morning, but it was also raining goals as Pakistan and South Africa served up a thriller in this Pool A match. Pakistan kept alive their hopes of qualifying for the Semi Finals, taking the three points, but they were pushed all the way by South Africa, whose points tally perhaps does not reflect their efforts so far in this tournament. In the third minute, South Africa scored the first goal of the match. Wade Paton played in Thornton McDade, who calmly drew the goalkeeper before slotting an excellent reverse stick finish underneath Imran Shah to give his side a dream start. The game see-sawed from end to end as both sides threw everything at each other, going close on a number of occasions to finding the net. Shakeel Abassi was causing a lot of problems, whilst Sohail Abbas saw his drag flick kept out by Rassie Piertse in goal. In the 20th minute, Pakistan equalised, which sparked a remarkable period of play, where the sides traded goals like two boxers standing toe-to-toe trade punches. Shafqat Rasool made a superb run into the D, slotting the ball past the goalkeeper, with Lance Louw hesitating in his attempts to clear, Abdul Haseem Khan capitalised and swept the ball home. South Africa won a penalty corner almost immediately. Justin Reid-Ross stepped up and despatched a trademark drag flick into the top corner giving the goalkeeper no chance, to make it 2-1. With the crowd still trying to catch their breath, Pakistan struck back again. Khan produced some individual brilliance, weaving between three defenders before setting up Rasool for a simple finish to draw the sides level. Pakistan promptly took the lead. Rasool lovely pass found Abassi in the D, his effort was smothered by Piertese but Khan collected the rebound and finished the chance with a minimum of fuss. The game had been turned on its head in a matter of minutes. 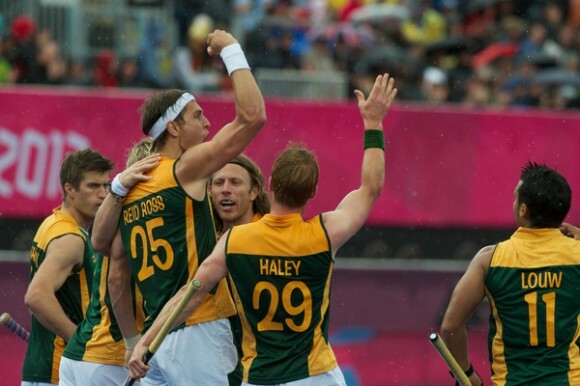 South Africa were by no means done, forcing a penalty corner on the stroke of half-time. Again Reid-Ross provided the goal, although Shah seemed to be wrong-footed and might have done better. After the half time break, there was no let up from either side. As they had done in the first half, South Africa drew first blood. A poor clearance by Shah found Wade Paton just inside the D. The 26-year-old midfielder steadied himself before slotting an inch-perfect shot inside the far post. Pakistan upped their efforts and pushed for an equaliser. Abassi was unlucky to see the ball bounce over his stick with the goal at his mercy, whilst Rasool, one of the stand out performers of the game was somehow denied by a splendid piece of defending by Andre Cronje. Pakistan were knocking at the door and with six minutes left, captain Sohail Abbas pulled them level from a penalty corner, his third goal of the tournament and his 348th in international hockey. With South Africa trying to cling on for a point, Waseem Ahmad grabbed a late winner, continuing his initial run into the D to pick up Khan’s touch and prod home from close range. It was a dramatic end to a superb game. South Africa had led three times, and somehow failed to kill off a Pakistan side that refused to be denied. The pace and power of the South Africans, was ultimately overcome by the technical skills and ability of the Pakistan squad. Pakistan will face Australia in their last pool game, hoping to upset the odds and qualify for the semi finals.